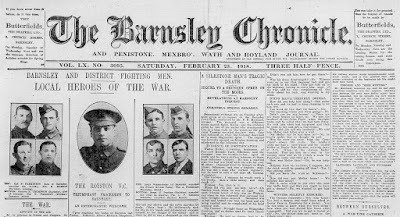 One of the mini-projects that the Barnsley War Memorials Project has been undertaking to try to find as many WW1 Barnsley soldiers as possible for the Roll of Honour of Barnsley's WW1 Fallen is the indexing of the war years (August 1914 - March 1919) of the Barnsley Chronicle. 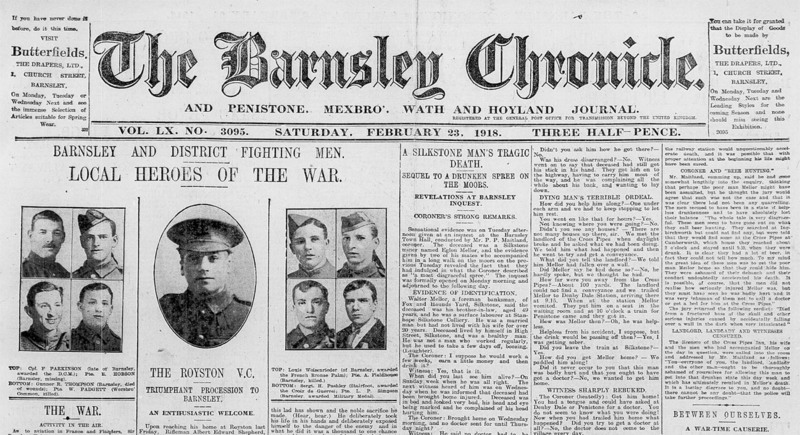 With the generous help of Barnsley Archives and the Barnsley Chronicle themselves, the BWMP has been able to provide home-working volunteers with digital issues of the Chronicle to read through at home, they then enter every instance of a man or woman affected by the war into an Excel spreadsheet and email it back to the volunteer co-ordinator for combination into a master index. Copies of the work done so far can be found on the shelves of Barnsley Archives who also have an electronic copy for their own use. This is hugely useful resource for anyone researching their servicemen (and women) ancestors in the WW1 period as it saves searching through the digital Chronicle one month at a time using the word search facility which can fall down when faced with fuzzy or damaged text. I have been working on an issue from 17 March 1917. This month had a partial index in the Archives already, based on the WW1 cuttings files, but it was very sparse, including only a small percentage of the potential names which might be of interest to people researching their WW1 ancestors. Yesterday I came across an unusually lengthy report of the Barnsley Tribunal concerning a man pleading conscientious objection on the grounds that he was a missionary. Tribunals were held regularly to hear the appeals of men who had been 'called up' once conscription began in 1916. Exemptions were sometimes granted for men on 'work of national importance' or conditionally for a few months to allow them to sort out their affairs before they reported to the services. "George Lister Greenwood (40, single), described as a missionary, stated that he had not appeared before the Tribunal before as he had been out of England. He said he had been a missionary in the United States and Canada, and had got to England on Christmas day. [...] He claimed to have been an itinerant minister of the Gospel for nine years, during which time he had sacrificed pecuniary benefits and sometimes risked his life. Applicant added that he felt entitled to exemption granted to ministers. He had a conscientious objection to military service, but had no objection to taking up work of national importance." To cut a long story short Alderman Rideal, examining George Greenwood, doubted the validity of his objection. The Clerk of the Tribunal agreed that as George was not in Holy Orders he was not covered by the blanket exemption of ministers. George, who stated that he had previously been a watch and clock repairer, offered to work on the land or in clerical work or teaching at which point Colonel Raley, another member of the Tribunal, noted that there was no work of national importance that was not connected to the war. George replied that prayer was work of national importance and asked if the panel believed in the 'Angels of Mons', to which Colonel Hewitt, military representative on the Tribunal replied, "We don't!". Eventually it was agreed that George should be sent to work on the land as a trial. I was curious about George Lister Greenwood's background and wondered how he came to be a missionary and what happened to him next. I found a George L Greenwood born on 19 Nov 1876 in the 1939 Register on Find My Past listed as a Bible Teacher. He was, in 1939, a patient at King's College Hospital, Denmark Hill, London. This date of birth matches the registration of George Lister Greenwood's birth in Barnsley in the fourth quarter of 1876. This man died in the beginning of 1940 in the Lambeth registration district of London. My search was complicated by a second man of the same name who was born in Keighley in West Yorkshire in 1877, which is near to Barnsley enough to suggest a possible family relationship between the two men. The second George Lister Greenwood died in Keighley in 1923 and probate was granted to a Minnie Greenwood, spinster. You will have to forgive me if the following rambles a bit - I find it helps to write everything down as I find it and then sort it out afterwards. I traced the Barnsley born George Lister Greenwood back in the census returns. His father, George Greenwood, was born in Haworth in West Yorkshire in 1840 to John Greenwood a tailor and draper, and after an apprenticeship to a draper in Dewsbury (noted in the 1861 census) married Sarah Ann Cooper in Barnsley in 1867. 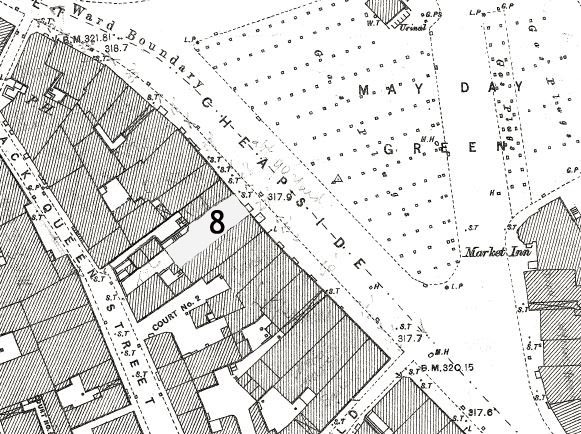 In the 1871 census the elder George is a Linen Draper living at 8 Cheapside in Barnsley - one of the main shopping streets in the town centre on the edge of May Day Green. According to the Tasker Trust website G Greenwood occupied that shop from 1869 to 1876. 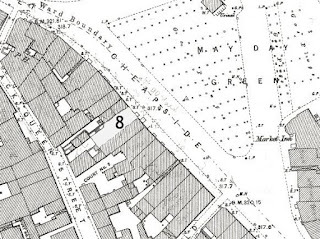 But then the family moves to a Drapers shop in Keighley (1881 census) and Bingley (1891 census) where George snr is listed as a School Attendance Officer. This allegiance to to West Yorkshire adds to my suspicions that the two George Lister Greenwoods may have been related. All four were born in Barnsley and were baptised at St Mary's church. In 1899 George Greenwood snr dies. He is buried in Cawthorne which confused me even more, especially as his abode is given as Haworth in the burial register. In the 1901 census his wife Sarah Ann has returned to Barnsley is living at the top end of Granville Street in the Old Town area. She appears to be supported by her three younger children, Kate and John who are Pupil Teachers and George who is a Clock and Watch Repairer (happily tallying with the newspaper report which prompted this investigation). Her eldest son, Thomas, who was a Solicitor's Clerk in 1891, has left home and I cannot find him in the census (yet). In 1911 Sarah Ann Greenwood now aged 76 is living at 64 Hope Street, Barnsley with her daughter Kate who is the Head Mistress of a government or municipal school. George, who is still a Watch and Clock Repairer is also still living with them. John Henry seems to have left home. Sarah helpfully tells us that she had been married 33 years and was 11 years widowed which confirms the information I had found on her marriage to George snr. She also notes that she had just four children and that in 1911 all are alive. This is valuable additional information and she need not have included it in the return as her marriage was not a 'present' one as defined in the census instructions, hence the red crossing out! I have found a record of Sarah Ann's death in March 1918 aged 83, she was buried in Cawthorne too, which gave me the idea of back tracking her. Yes, she was baptised in Cawthorne in 1834, daughter of Thomas Cooper, a carpenter and Priscilla his wife, who gave their abode as Barnsley. Both Thomas and Priscilla are also buried in Cawthorne, so Sarah buried her husband George near her parents and then joined him in the fullness of time. While looking into burials at Cawthorne I also spotted that Kate Emily Greenwood was buried there in 1948, having died a spinster (not unusual for a schoolteacher in that era) in Bristol. The probate of her will is left to John Henry Greenwood, retired barrister, presumably her brother. Meanwhile various searches on George Lister Greenwood had indicated that he had a Passenger List record arriving in the USA in 1915. I do not have a Worldwide subscription to Ancestry so I called into Cudworth Library, which like all the other library branches and the Archives in Barnsley has a subscription to the Library version of Ancestry. It is completely free to use and I was able to look up George's travels and email the relevant pages home to myself. As you can see above George sails in May 1915 to Boston, Massachusetts and gives his occupation as Missionary. His next of kin is listed as his mother Mrs Greenwood of 64 Hope Street, which agrees with the address of the family in 1911. A further Passenger List confirmed that George returned home on the "Finland" which arrived in Liverpool from New York on 25 December 1916. Ah, ha! Just as he claimed at the Tribunal in March 1917. As I searched for George in the worldwide records I was surprised to get hits on his brother Thomas Cooper Greenwood. He had arrived in Canada before 1899 (which accounts for him being missing from the 1901 census entry for the rest of the family in Barnsley) because he marries a lady called Margaret Unger in Toronto in April that year. His occupation at his marriage was Journalist and his identity is confirmed by the names of his parents as George and Sarah Ann Greenwood. By 1910 he is living in the state of Michigan, USA with his second wife Mabel and her two children from her previous marriage. He states that he arrived in the USA in 1905 and that he is a Journalist. In 1920 Thomas applies for an American passport as a Naturalized Citizen for himself, Mabel and his adopted son Stanley. Details of his birth in Barnsley and his emigration from Canada to America in 1905 are given. He is still a Journalist. Could it be that when George visited America from 1915 to 1916 that he was visiting his brother? A further fascinating document appeared on Worldwide Ancestry for Thomas Cooper Greenwood, a record of his death in France in 1933 aged 63. The names and addresses of his wife Mabel, stepson Stanley, brother John and sister Kate are given, but no sign of brother George! If George was the man in the hospital in London in 1939 he was still alive at this point, but his family don't seem to know where he is. I am no wiser as to why George Lister Greenwood became a Missionary. He is not listed as a Conscientious Object in Cyril Pearce's list on Lives of the First World War, but I will add him to LFWW in a day or so (I have the power to do that as an official IWM volunteer). I can use the newspaper article and the passenger list as proof of his occupation as a missionary. I might have worked out why he went to America, but after his appearance at the Tribunal in Barnsley in 1917 he vanishes from the online records for over 20 years as far as I can see.